Coming from a family of stylists, Cindy has been immersed in hair styling from a very young age and has a true passion for it. Years of styling has allowed Cindy to master all aspects of hair coloring, cutting, and styling. Even with the numerous years of experience, Cindy prides herself in being a life-long learner and attends professional hair conferences twice a year. These conferences allow Cindy to translate current techniques and fashion into her practice at Shear Success. After her excellent skill and creativity, Cindy is most known for her wonderful and caring personality. She is very proud to have developed such great relationships with her clients and strives to provide the best and most compassionate service. 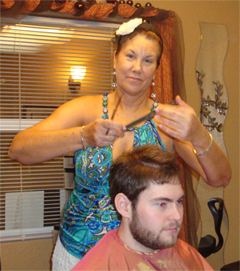 Born in Dunedin, Diane has been a professional hair stylist for many years. 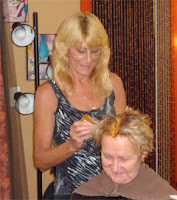 Diane has a true passion for everything hair and loves the many facets of hair styling, cutting, and coloring. Diane is the “go-to” girl for French braiding, party, and event styling at Shear Success. As her clients would say: ”Diane is truly a exceptional hair stylist and caters to all different styles and cuts for her customers”. 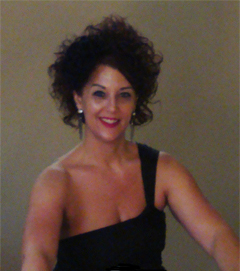 Starting her career in Illinois, Starr has been a professional hair stylist for many years. Starr was a great addition to the Shear Success team 8 years ago and was able to bring different perspectives and styles to the salons skill set. Proficient in all hair styling techniques, Starr is also known for her amazing shampoos. Starr brings great versatility and creativity to the Shear Success team as well as positive and friendly personality. Without a doubt, Starr will do whatever it takes to create the right look for you! From the onset, Beverly has been an integral part of the Shear Success team. From highlights to perms, Beverly is skilled in all types of hair care and is able to create sophisticated and super-trendy looks for her clients. Coming in with an idea of how you want your hair to look? Strong and creative from years’ of experience, and also a regular hair show attendee , she is able to precisely translate her client’s ideas into the perfect hair style. Not sure what direction you want to take your hair style? You are also in luck! Beverly is able to create an entirely different look that is sure to be trendy and refreshing! Linda joined us from a prestigious salon in California. A hairstylist with over 20 years of experience, Linda is an expert in updos, all phases of foils & color techniques, and meticulous razor cutting to achieve your perfect look. She is proficient in achieving the look you will dream about for wedding parties. Experienced in styling the creation you would like with all hair types. Joining the Shear Success team 8 years ago, Jody has revolutionized skin care in Dunedin. Using only the highest quality Atzen products, Jody believes that everyone deserves to have beautiful and healthy skin. Jody offers many different facials including Microdermabrasion and Glyco 30 Peels. Some of the benefits of Microdermabrasion include brightening of the skin, even skin tone, reduction in fine lines and pores, helps with with hyperpigmentation, and sun damage. Glyco 30 Peels help treat fine lines, dead skin, dryness, acne, and hyperpigmentation. These techniques are only a glimpse of the services that Jody provides. With Jody’s knowledge and experience, she is able to cater to each of her clients on an individual level. In harmony with the views of many dermatologists, Jody understands the importance of having great skin and the impact it can have on each client’s confidence and success. 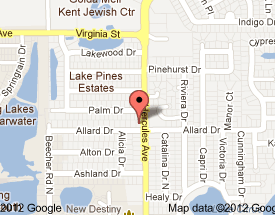 your desires nail tech…your search is over!